1873 Buntline Target is an Italian 6-shot single action revolver chambered for the .357 Magnum or the .45 Colt cartridges, manufactured by A. Uberti, Srl.. The revolver has an 18" barrel with no muzzle brake or ports. It comes with a walnut grip and a dark blue finish. The Beretta Laramie is a single-action revolver produced by Beretta. It is modeled after the Smith & Wesson Model 3. The Beretta Stampede is a single-action revolver manufactured by Beretta that is an exact clone of the Colt Single Action Army "Peacemaker". 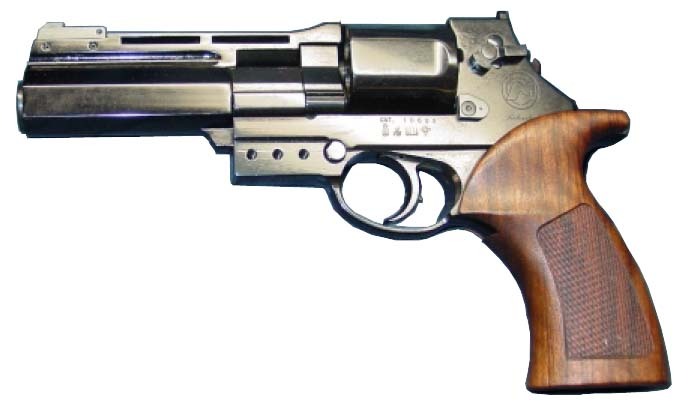 (often known simply as the Mateba or the Mateba Autorevolver) is a recoil operated semi-automatic revolver, one of only a few of this type ever produced. It was developed by Mateba, based in Pavia, Italy.